In the Washington, DC, region, 13 wastewater treatment plants currently discharge effluent into the Potomac estuary. As of 2000, nine major plants (Table 8-2) served about 4 million people and discharged a total of about 467 mgd (Howard, 2001). The 318-mgd discharge of the Blue Plains plant, which serves the population of Washington, DC, accounts for about two-thirds of the total effluent discharge to the Potomac estuary during low-flow conditions (Figure 8-6). Figure 8-6 Long-term trends in effluent flow rate of municipal wastewater facilities. Sources: MWCOG, 1989; Howard, 2001; Jaworski, 2001. 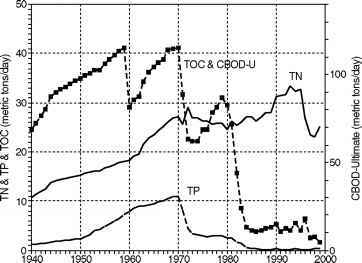 Figure 8-7 Long-term trends of TOC, total nitrogen, and total phosphorus effluent loads from municipal wastewater. Sources: Jaworski, 2001; Nemura, 1992; Howard, 2001. Over the past 60 years, trends in TOC and nutrient loading have reflected a growing population and increasing levels of wastewater treatment. The reduction in BOD5 loading resulted from the implementation of secondary treatment at Blue Plains in 1959 and at the other facilities from 1960 to 1980. The dramatic drop in phosphorus loading by 1986 resulted from phosphorus controls implemented, beginning in the early 1970s, at all the major wastewater treatment facilities to minimize eutrophica-tion in the Potomac estuary. Nitrogen loading, however, has increased with population in the absence of controls on effluent nitrogen levels (Figure 8-7). DO, influenced by temperature, wastewater loading, and freshwater flow, is characterized by seasonal and spatial variations, with minimum levels observed during the high-temperature, low-flow conditions of summer. Historical DO data are available to characterize long-term changes in the spatial distribution of oxygen during the summer (July-September) over a distance of approximately 55 miles from Chain Bridge to Mathias Point. These historical data sets clearly show the significant problem with oxygen depletion during the 1960s (1960-1964, 1966) with recorded concentrations of less than 2 mg/L downstream of the Blue Plains wastewater treatment plant [located at about River Mile (RM) 106] (Figure 8-8). 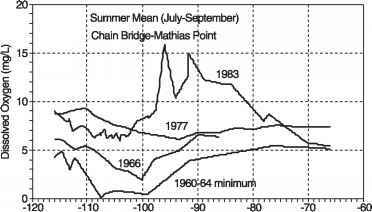 Figure 8-8 Long-term trends in summer DO levels at Chain Bridge-Mathias Point. Sources: Davis, 1968; Thomann and Fitzpatrick, 1982; Fitzpatrick and DiToro, 1991. Figure 8-9 Long-term trends in summer DO levels on the Potomac River near the Wilson Bridge (River Mile 95). 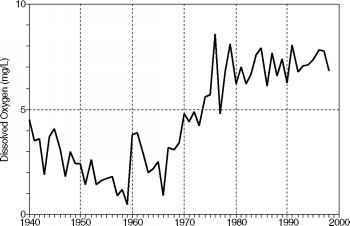 (Data for 1940-1986 from MWCOG averaged from June-September, data for 1987-1995 from Jaworski (2001) averaged from July-September.) 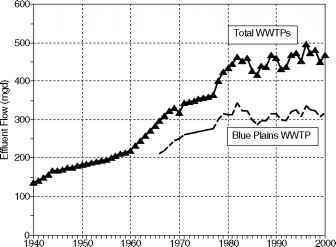 Sources: MWCOG, 1989; Jaworski, 2001.
reflect the reduction of freshwater available for dilution because of drought conditions (see Figure 8-4) rather than any increase of pollutant load. The water quality standard for DO of 5 mg/L was typically violated during the 1960s and 1970s. Compliance was attained for the summer average condition only after all the regional wastewater treatment plants achieved secondary treatment by 1980; minimum summer levels, however, continued to periodically be less than 5 mg/L (MWCOG, 1989). From a policy and planning perspective, the central question related to the effectiveness of the secondary treatment requirement of the 1972 CWA is simply: Would water quality standards for dissolved oxygen be attained if primary treatment levels were considered acceptable? In addition to the qualitative assessment of historical data, water quality models can provide a quantitative approach to evaluate improvements in water quality achieved as result of upgrades in wastewater treatment. The Potomac Eutrophication Model (PEM), developed by Thomann and Fitzpatrick (1982), was enhanced by Fitzpatrick and Di Toro (1991) to represent two functional groups of algae. Fitzpatrick and Di Toro's (1991) version of PEM has been used in this study to demonstrate the water quality benefits attained by the technology- and water-quality-based regulations of the 1972 CWA for municipal wastewater facilities. The Potomac Eutrophication Model (PEM) was calibrated using observed data sets collected from 1983 through 1985. In the summer of 1983, an anomalous bloom of the blue-green alga Microcystis aeruginosa formed a dense, brilliant green scumlike mat on the surface that extended over a distance of about 20 miles in the central estuary and embayments. Peak chlorophyll levels in the main river were ~ 300 ^g/L, and dense concentrations as high as ~ 800 ^g/L were recorded in the embayments (Thomann and Mueller, 1987). During the peak of the bloom in September 1983, dissolved oxygen levels computed with PEM were in reasonable agreement with the observed monthly mean data (Figure 8-10); concentrations of ~ 6 mg/L were observed and simulated in the vicinity of the Blue Plains wastewater treatment plant (RM 105) (Fitzpatrick and DiToro, 1991). The rapid increase from ~ 6 mg/L to observed (~ 10 to 16 mg/L) and computed (~ 12 mg/L) levels of dissolved oxygen ~ 5 to 10 miles downstream from Blue Plains is caused by high rates of phytoplankton primary productivity associated with peak algal biomass levels of ~ 150 to 250 |j.g/L (as chlorophyll a) in the vicinity of the Woodrow Wilson Bridge (RM 95). Further downstream in the transition zone of the Potomac estuary, observed and computed dissolved oxygen levels decline to ~ 5 to 7 mg/L in the vicinity of Indian Head (RM 85) to Maryland Point (RM 65) as a result of the attenuation of the Microcystis bloom by nitrogen limitation and the effects of salinity toxicity (Fitzpatrick and DiToro, 1991). As documented by Fitzpatrick and DiToro (1991), oxygen, algal biomass, nutrients, BOD5, inorganic carbon, pH, and salinity simulated with the Potomac Eutrophication Model is considered well calibrated to the observed data for the summer periods during September 1983 (Figure 8-11), September 1984, and September 1985. Figure 8-10 Potomac Eutrophication Model comparison of simulated DO for primary, secondary, and greater than secondary effluent loading scenarios. Observed data are for September 1983 calibration. Sources: Fitzpatrick, 1991; Fitzpatrick and DiToro, 1991.
during the lower-than-average flow conditions of September 1983, the calibrated model was used to evaluate the water quality impact of two regulatory control scenarios based on an assumption of (1) primary treatment and (2) secondary treatment compared to the existing (ca. 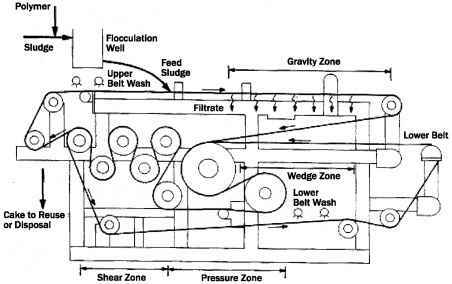 1983) effluent loading for all the municipal facilities in the Washington, DC, region (Fitzpatrick, 1991). Water quality conditions for these scenarios were simulated using freshwater flow data for 1983, a year characterized by summer flow (2,333 cfs) that was about 53 percent of the long-term summer mean flow of the Potomac River (see Figure 8-4). Other than the effluent characteristics, the ratio of ultimate-to-5-day BOD and the oxidation rate for CBOD (Kd) were the only parameters changed in the simulations to reflect differences in the proportion of refractory and labile organic carbon for the different levels of wastewater treatment (Fitzpatrick, 1991; Lung, 1998; Thomann and Mueller, 1987). For the primary simulation, a value of Kd = 0.21/day, obtained from the original PEM (Thomann and Fitzpatrick, 1982), is typical of wastewater effluent characterized by the high CBOD concentrations typical of primary treatment conditions observed during the 1960s. For the secondary simulation, a value of Kd = 0.16/day, obtained from the original PEM (Thomann and Fitzpatrick, 1982), is typical of wastewater effluent characterized by the intermediate CBOD concentrations typical of secondary treatment conditions observed during the late 1970s. 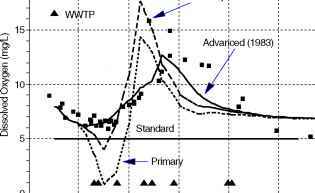 For the advanced (actual 1983) loading scenario, a value of Kd = 0.10/day, obtained from calibration of the updated PEM (Fitzpatrick and DiToro, 1991), is typical of wastewater effluent characterized by the low CBOD concentrations of advanced secondary and tertiary treatment conditions observed during the mid-1980s.